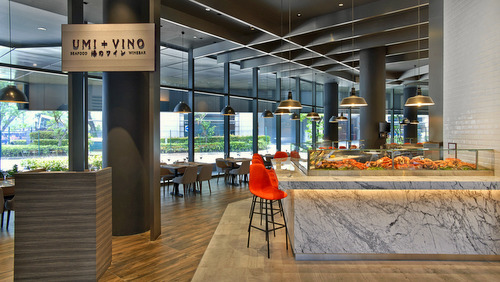 UMI+VINO Seafood Winebar operates within Singapore’s Marina Square shopping centre, at 6 Raffles Boulevard. 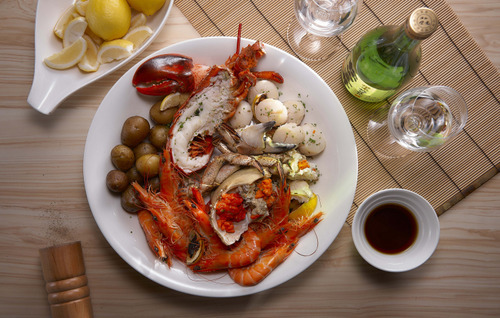 Visiting the European-Japanese seafood winebar, you’ll get to indulge in the perfect combination of sparkling wines and seafood at a contemporary setting. You can relish on the freshly shucked oysters, UMI+VINO’s signature chilled seafood platters, or savour the preserved natural flavours of fresh seafood that has been done A La Plancha -style on a hot grill. The menu alternatives are Ala Carte Menu, Set Lunch Menu, Beverage Menu, as well as Set Dinner Menu. Some of the highlights on the Ala Carte menu include Homemade Lobster & Crab Bisque, Crispy Blue Swimmer Crab Cakes, Lobster Prawn & Scallop Burger, 48hr Duck Leg Confit + Parma Ham + Lentil, USDA Tomahawk Grilled Steak, Cold Seafood Platter & Ginger Chilli Dip, and Hot Mediterranean Chorizo Olive Seafood Platter. UMI+VINO Seafood Winebar is owned and managed by Emporium Shokuhin Dining Concepts, which also has a range of other restaurant & bar brands in Singapore. Burosu Honten Gyoza & Ramen, Kohi-Koji Café & Bakery, and Kome Kome.